Many people claim that the smartphone is the new Swiss Army knife for the younger generation because it does everything you could ever need in today’s tech-driven world. While it might be able to find out who invented the toilet (it was John Harington, by the way), you couldn’t do anything physically useful with an iPhone. 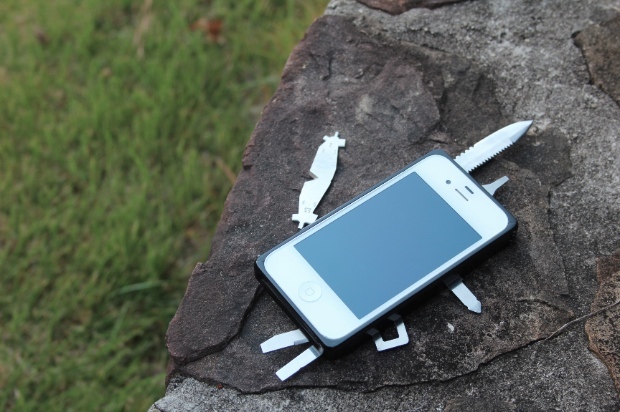 The TaskOne case for iPhones takes your phone and turns it into a really useful multi-tool that can do anything. 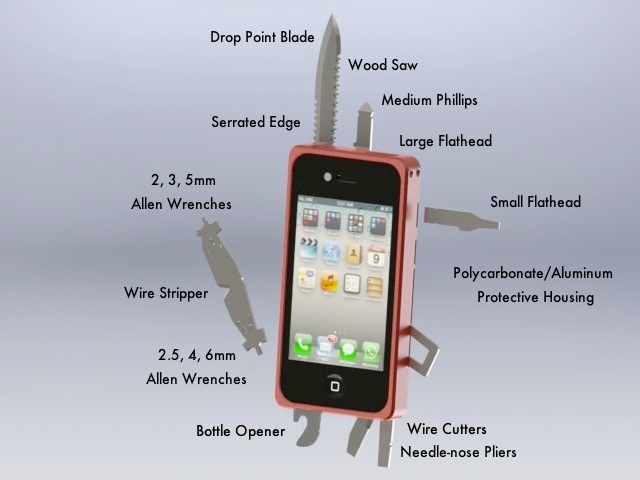 The iPhone case includes 16 high-quality tools, including a knife, screwdrivers, bottle opener, Allen wrenches, pliers and more. Let’s focus on just the knife for a moment—since we are a knife blog, of course. The 2.5-inch serrated drop-point blade is on par with most pocket knives and retracts into the case’s body when you’re not using it. It can be engaged halfway for smaller jobs, but although it says there’s a steel lock, details about what sort of locking system it uses aren’t available. This case comes from the mind of former Apple engineer Addison Shelton and has undergone a number of iterations to reach perfection. There are a few questions and concerns about the TaskOne case, however. For example, can this case be taken on a plane? The answer is yes, but with a caveat. You can take this case on a plane, but you must remove the knife portion of the case, which they made easily removable for this very reason, and store it in your luggage. Another criticism is that you probably wouldn’t want to use your several hundred dollar iPhone to saw branches or fix a bicycle. Well, the case is designed to protect your phone anyway and as long as you don’t throw it against jagged concrete, your phone should be fine. I haven’t used it yet (though I would sure love to), but the case has brilliance written all over it. If you’re wondering where you can pick up one of these, they aren’t in mass production yet, but you can support this independent project and get one of these awesome cases in the process over at Indiegogo. Again, head over to the website to learn more about the TaskOne and pick one up. It’s a must-have for the techie who’s also handy. Final release – TaskOne product video from Addison Shelton on Vimeo. I’ve wanted something like this for a long time. No one seems to combine electronic and mechanical gadgets in the same package. Agreed and unfortunately it looks like this tool is long gone.